It had to happen at sometime… on Sunday my camper van Nigella met the AA breakdown service for the first time. Well after all her luxury of sitting for years looking out over the Bristol channel, now that Nigella’s regularly out on the roads, she’s bound to show up a few areas in need of mechanical attention. Over the last few months I’ve believed more and more that she is not merely a machine, in fact the more I’ve gotten to know my new camper, the more I believe that she has a whole life of her own…. Remember the Herbie films, by Walt Disney? There were 6 of them made, dating from the 1960’s right up until 2005, in which a lovable Volkswagen Beetle called Herbie was capable of driving himself. Shortly after taking on Nigella I became convinced that the original script writer of the Herbie films must have indeed himself owned a VW. Not that, (or as far as I’m aware), Nigella my camper has driven herself onto a race track and competed, or been to Monte Carlo; but she has certainly been displaying various Herbie like traits. I’ve been rather embarrassed by her occasional, almost temperamental outbursts. Slightly more scarily, a couple of times I’ve had to react with lightening quick reactions on her brake pedal! But if I’m learning anything about my camper van, it’s that she’s far more than a hulk of automated metal and that it takes a lot more than a good bit of grease to keep her in check! Whilst driving up to teach at Coates English Willow on Thursday she decided to cut out her engine whenever I changed down gear. Luckily I was not far away from my destination and managed to keep restarting her enough times to eventually crawl her into the car park. (Surprisingly I’m perhaps beginning to learn some of her ways because I’m usually pretty good at flooding her engine when doing short stops). Yes, I was sad that after two days full on teaching I would be having to then call out the AA, but bizarrely part of me was relieved that she was still exerting herself – and that maybe she’d receive some kind of diagnosis! On Sunday morning we were rescued. It began with a cold and grey start and with me a little pensive about calling out the AA for Nigella for the first time. I’ve heard so many jokes about how I will now be regularly joining a very long line of old VW campers broken down on the A30. (My retort has been that at least I will be able to make myself a decent cuppa whilst awaiting rescue….) I was concerned that Mr AA man would get out of his shiny modern VW van and laugh! However, without a computer plug-in insight and me timidly making conversation about how lovely it must be for a breakdown mechanic to nowadays be able to get all mechanical, Nigella was diagnosed with having a sticking idle control valve. Questions asked of me such as, “Has she been running rich?” I replied to with an answer along the lines of, “Well she’s been quite expensive on petrol but everyone told me to expect that!” I do have a lot to learn…. Thanks to the AA breakdown service Nigella got temporarily fixed, including a lovely clean up of her spark plugs and I was able to drive safely back to Devon. On reaching home I realised just how much I’d been previously holding my breath every time we had to pull up at traffic lights, how I’d had underlying panic whenever I’d seen a queue forming ahead… However, soon Nigella will now have a new idle control valve and I’m meanwhile searching for a basic vehicle maintenance course. I’m now though left wondering. My future journeys with Nigella will hopefully and gladly be more relaxing, but have I again just taken away a little bit more of her soul? Even worse, what if I’ve only ever imagined my slightly temperamental, living and breathing machine into existence? What if now with every repair she looses a bit of her character until one day becomes merely a van, only a van, who I simply drive from a to b? Then I think of Herbie in the films and begin to smile. Wikipedia says ‘Herbie the Love Bug is a fictional sentient anthropomorphic 1963 Volkswagen Beetle’ with a ‘mind of his own’. Whilst I know that Wikipedia can at times be skewed, (and yes I have registered the word ‘fictional’!) I do believe that this description offers me hope. In over the 40 years of films, Herbie survives numerous incidents and eventually, remodeled, falls in love with a Volkswagen New Beetle. I know that Nigella isn’t an original T2 camper van, but excusing a little bit of electrics here and there, and 2mm less thick steel, she’s pretty much the same as a 1973 model. She’s definitely part of my reality and I reckon it would really take some doing to rid her of 40-ish years of character. So I’ve made the decision to see this as even more of an adventure, to happily co-exist with my very own sentient anthropomorphic VW for some time to come. I’m going to learn how to maintain her, refurbish her in willow and… I think I’ve found the solution! 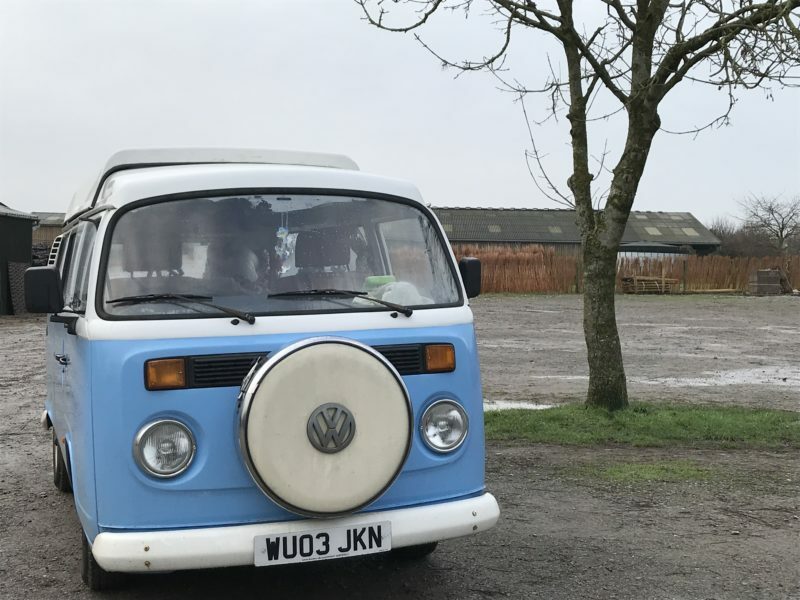 Since taking on Nigella last September I’ve only ever met one other T2 camper van on the road, but I reckon, just as in Herbie’s last film, what she may just need is loving company. Roll on the spring and summer, the A30 laybys crammed full of camper vans and the VW festivals. Nigella is going to get her Hula garland on and go have some fun!